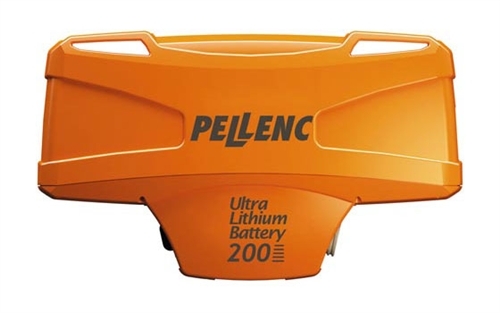 The Pellenc ULiB 200 battery is a powerful high capacity battery aimed at the professional user with an excellent power to weight ratio. Pellenc is the only manufacturer in the world to use the revolutionary lithium-ion ternary technology (nickel/ manganese/ cobalt). To generate the same amount of energy, a nickel cadmium (Ni Cd) battery would weigh 13.5kg as opposed to 9.7kg. The ULiB batteries enable between half a day and a full days work. The power remains constant whatever its energy level. All Pellenc batteries have a display showing the remaining capacity in percentage in relation to the initial capacity.